I love stuffing. 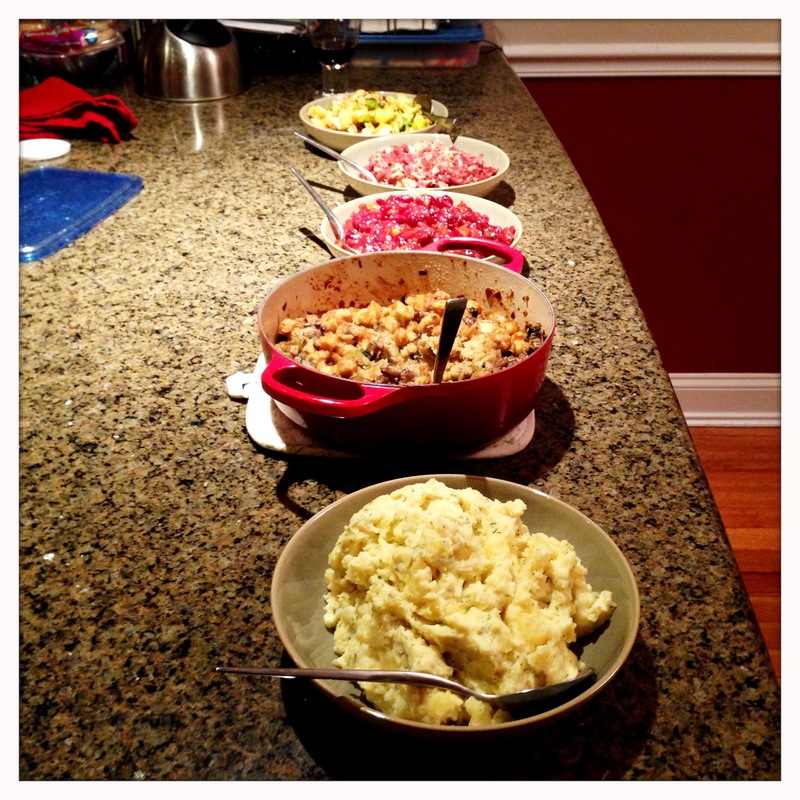 I love it so much that I’m leading off my holiday meal series with stuffing before the main course. Part of what I love about stuffing is the way it gives me a blank slate in the kitchen. Nearly anything can be added to stuffing. 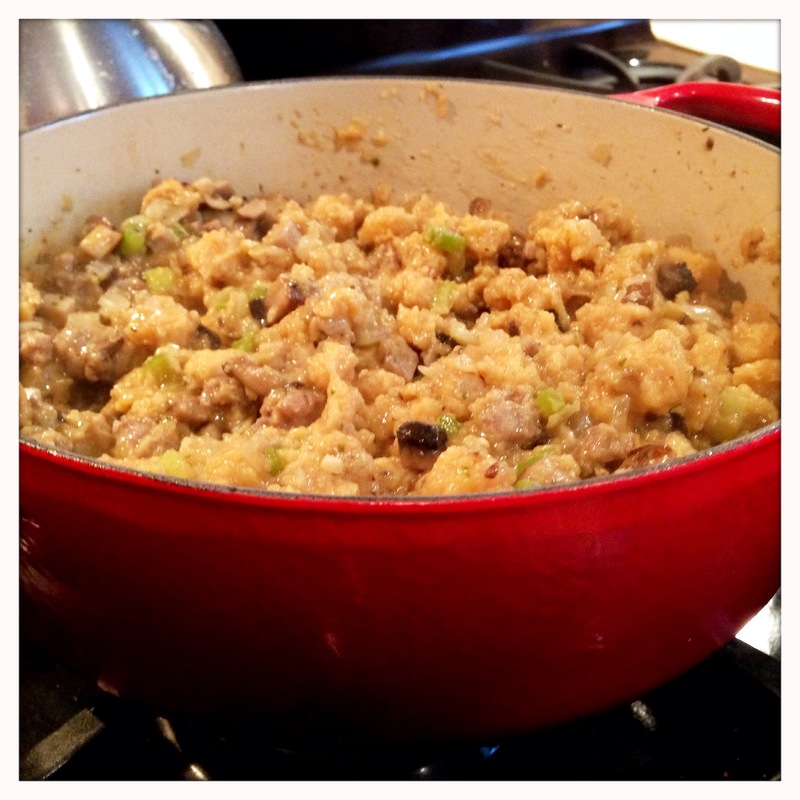 For years I made a point of improving basic bagged stuffing by adding fresh vegetables and mushrooms. This year, I decided to step up my game a bit further and dry my own bread to truly make my stuffing from scratch. I started with a hearty multigrain sourdough, added a hefty dose of mushrooms and veggies and finished it with an herb and spice blend to mimic the seasoning of the main course (in this case, cornish hens, which will be featured in a future post). Making stuffing from your own fresh bread is a small amount of work that goes a long way. If you don’t want to take the extra time, however, this recipe works just fine with bagged stuffing cubes. Let’s get started. If you are drying your own bread, this first step should be done the day before you plan to make your stuffing. Preheat your oven to 250 degrees while you are cubing the loaf of bread. Once the oven is preheated, turn the heat down to 200 degrees. 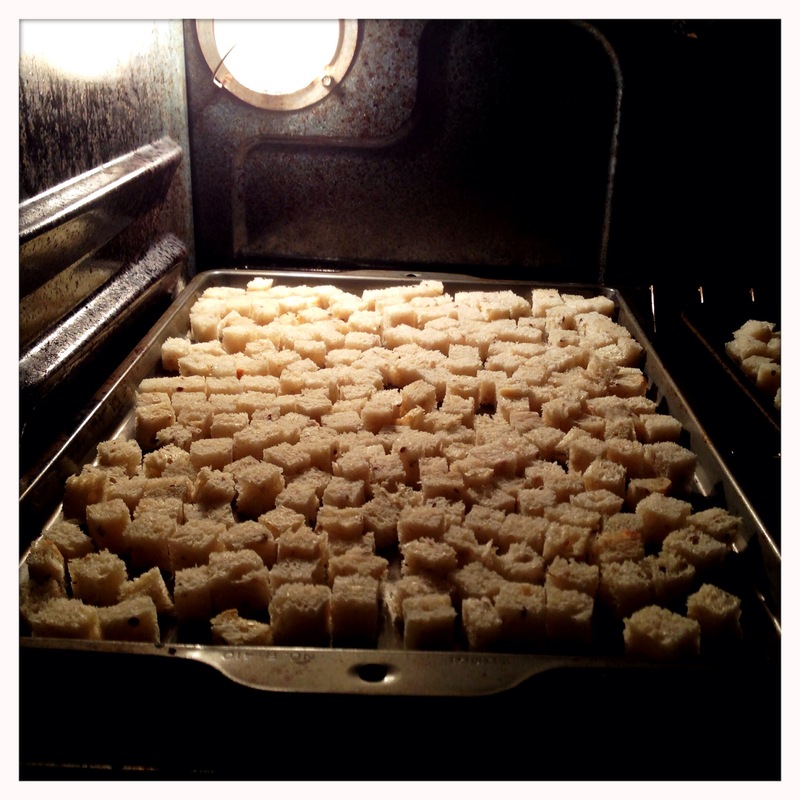 Lay the bread cubes on a baking sheet in a single layer, and place in the oven. Bake at 200 degrees for 10 minutes. 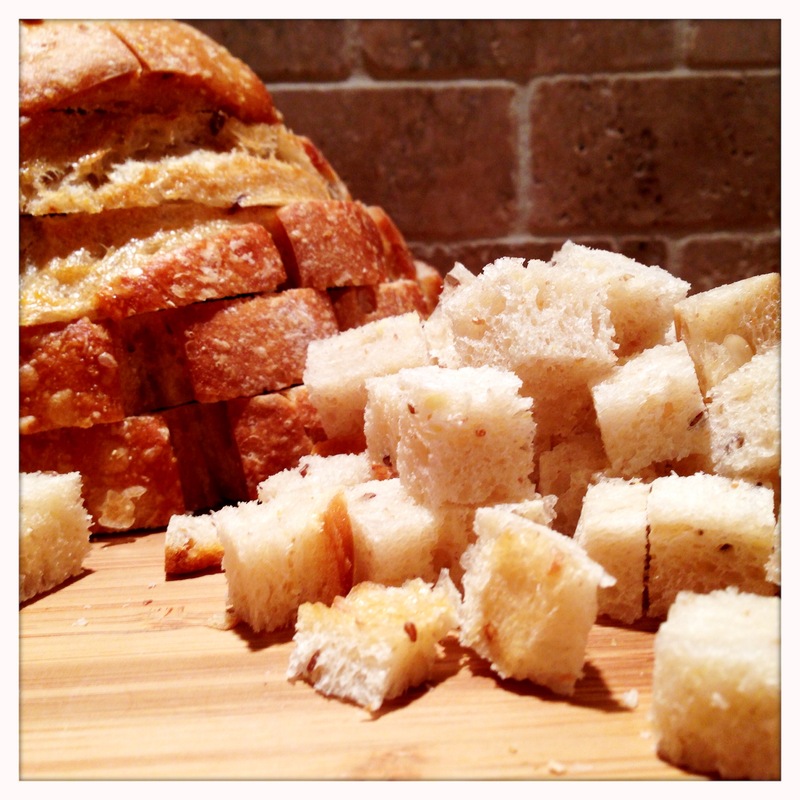 Check on the bread at the 10 minute mark, and gently stir the cubes around for even drying. The cubes will likely not be dry at this point, so bake another 10 minutes. Continue to bake at 10 minute intervals, checking and stirring after each interval. When done, the bread will feel dry like a crouton and may be just beginning to brown. Store the cubes overnight at room temperature to allow the cubes to completely dry. When it’s time to make the stuffing, heat some butter and olive oil in a heavy, oven safe pan. 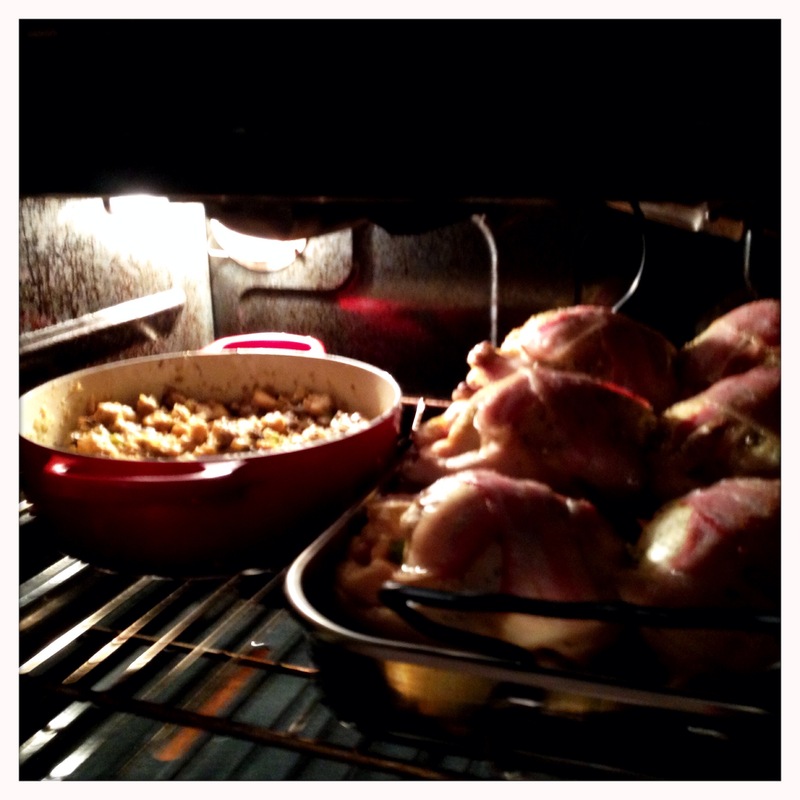 I use a French oven since it is easy to take from the stove top to the oven to the table. 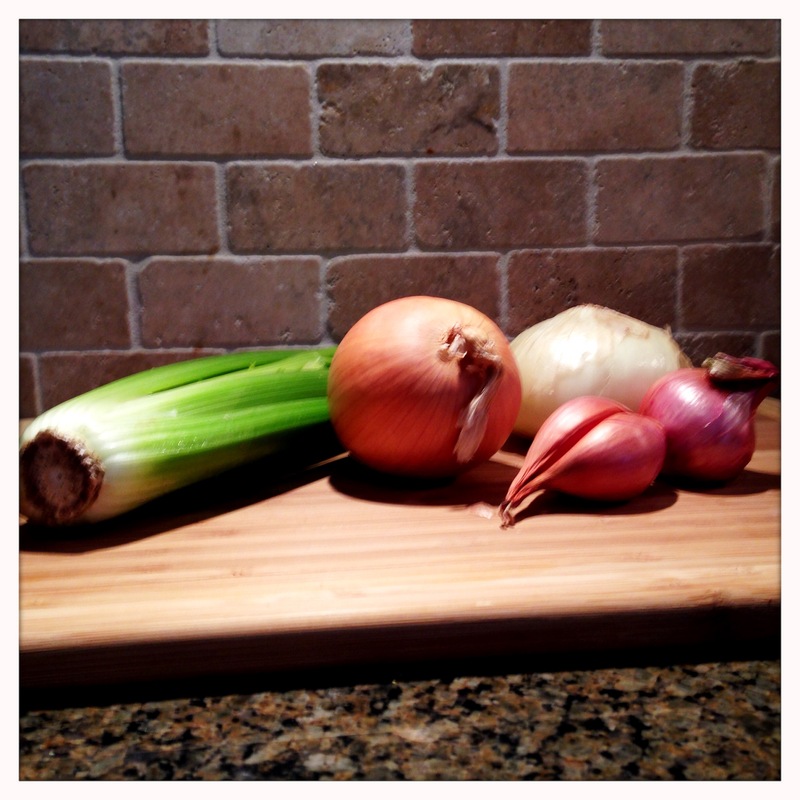 Once the butter and oil are hot, saute the celery, shallots and onion. Season with salt and pepper to taste. While they start to cook, turn your attention to the breakfast sausage. 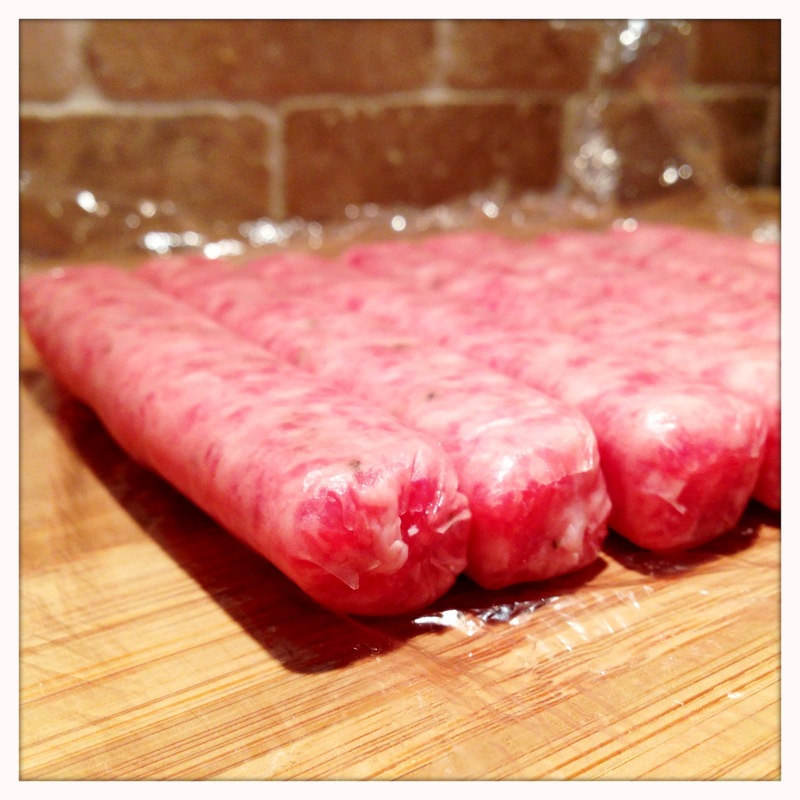 Remove the casings from the breakfast sausage, and break the meat into small chunks. Add to the pan and brown the sausage. 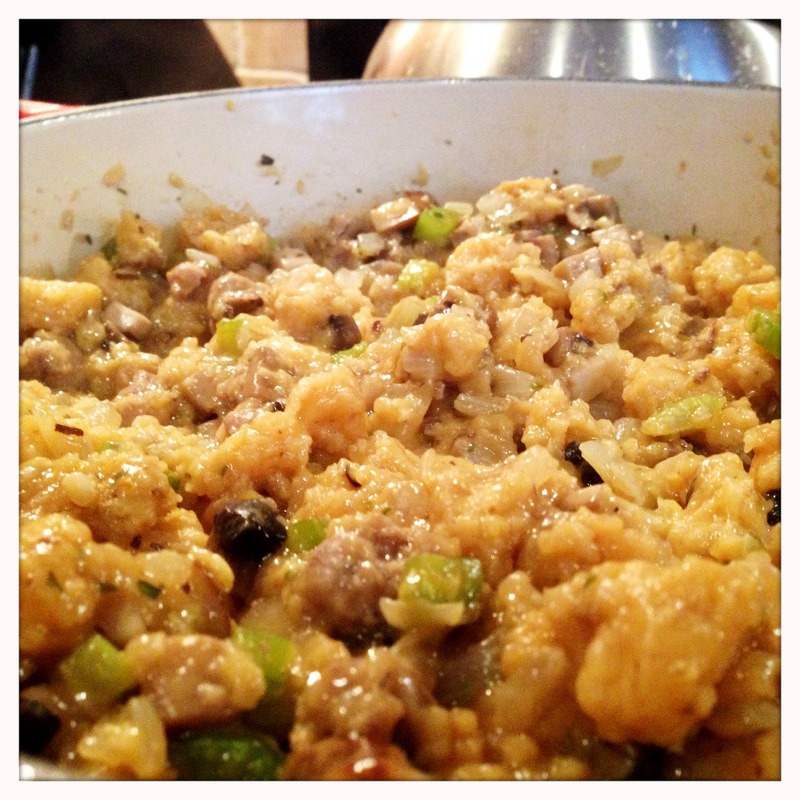 Once the sausage is browned, add the garlic and mushrooms. You can add more butter and/or oil as well if needed, but the sausage should have rendered out plenty of fat to keep things moist. Season with your herb blend, and cook until the mushrooms are soft and cooked through. 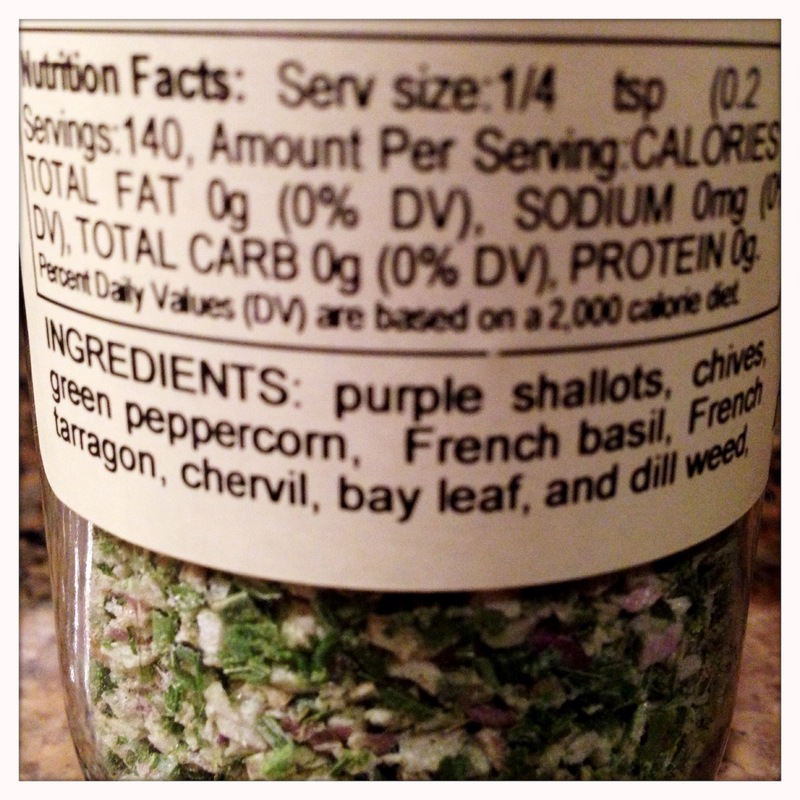 This is the blend of seasonings I used for my birds and stuffing. When possible, I like to use salt-free blends so that I can control the salt content myself. While the vegetables and mushrooms are continuing to cook, bring the chicken stock to a boil in a second pot. 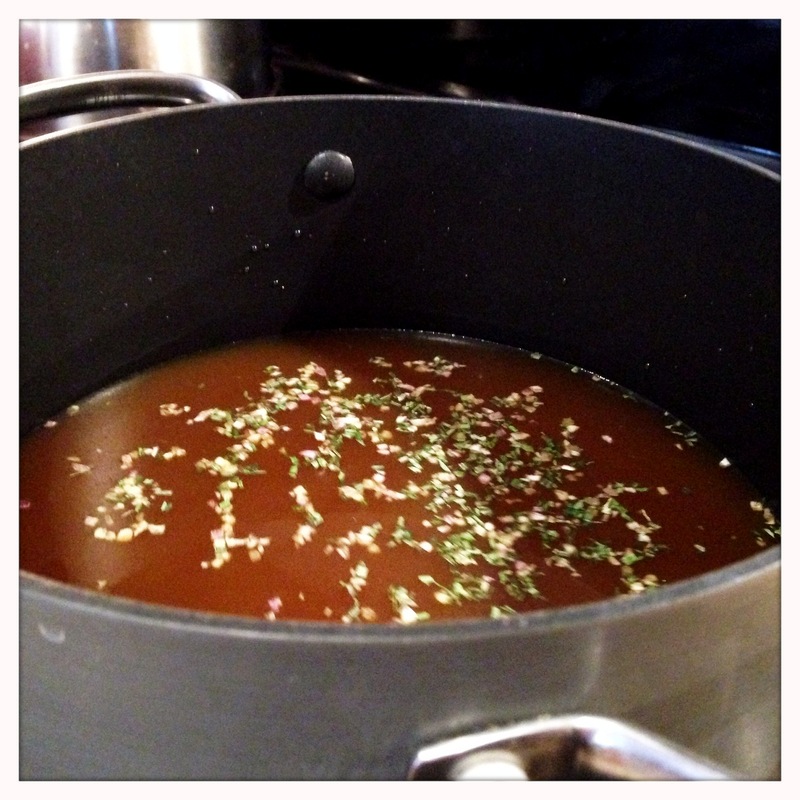 I like to add some pepper and my herb blend to the stock while it comes up to a boil. Once the stock is boiling, turn the heat off, and add the bread cubes. Stir gently for a few minutes until the bread is evenly wet and soft. 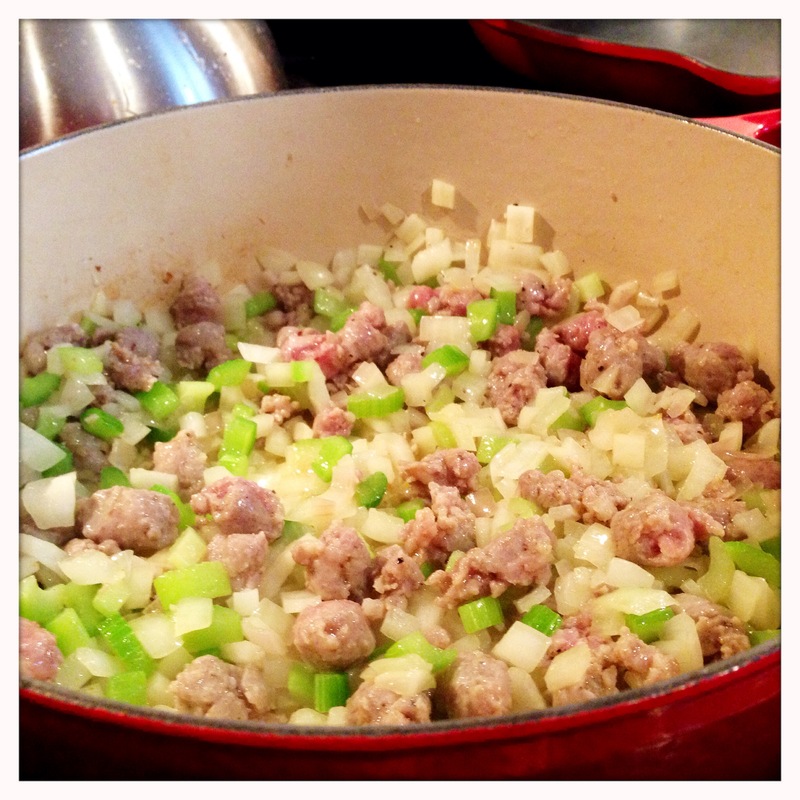 Add the stock soaked bread cubes to the pan with the vegetables and sausage and stir thoroughly to combine. At this point, the stuffing is technically “done,” and can be served as is. I, however, prefer to finish it in the oven. This browns up the top and lets the flavors mingle further. I recommend putting it in the oven, uncovered, during the final 20-30 minutes of cooking time for the rest of the meal. I ended up doing about 25 minutes at 400 degrees based on the rest of my meal. Stuffing can certainly be cooked inside a bird if that’s what you’re making. It will increase the cooking time of the bird, though, and does carry some increased risk of food-borne illness if you’re not extra careful about getting everything up to the right temperature. Using a good chicken stock imparts enough poultry flavor to the stuffing, in my opinion, and if it’s topped off with a little homemade gravy, I think the time inside the bird is an unnecessary step for great stuffing. Grab a plate and dig in! While it is just one of many side dishes at most holiday meals, it is by far the most important in my opinion. Stuffing is practically a meal in itself (and I have made many a meal solely out of leftover stuffing), and the extra time and effort spent making your stuffing from scratch is well-rewarded with an impressive depth of flavor and texture. Give it a shot, and you won’t be disappointed. Enjoy!